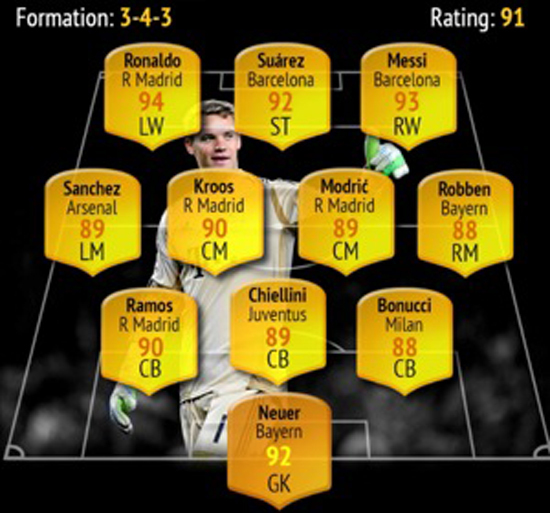 Bookmakers bwin have assessed every player on the game to assemble a series of 'best squad' recommendations for a variety of gamers – depending on if they prefer career mode or ultimate team, and if they're willing to invest coins or always hunting for a bargain. The ULTIMATE Ultimate Team: Designed for gamers who are happy to invest in coins or dream of building the best possible squad on the draft. With a total ranking of 190, all 11 players have full 10 chemistry and you'll shoot up the leagues. The DREAM Career Mode squad: Designed for gamers who fantasise about achieving the magic transfer window as manager and chairman on career mode. With an average rating of 91, only Alexis Sanchez makes the cut from the Premier League! Best Possible 11s across Europe: La Liga is officially the strongest league in the game. Premier League 11 is second strongest and features players from the most clubs. Neymar has joined the weakest of the top 5 leagues. Best Possible Premier League 11 – 88 rated: De Gea – Alderweireld, Vertonghen, David Luiz – Sanchez, Pogba, Fabregas, Mkhitaryan – Hazard, Aguero, Willian. Manchester City and Arsenal only have one representative in the team. Best Possible Bundesliga 11 – 87 rated: Neuer – Alaba, Hummels, Boateng, Piszczek – Ribery, Vidal, Robben, Rodriquez – Aubamayeng, Lewandowski. 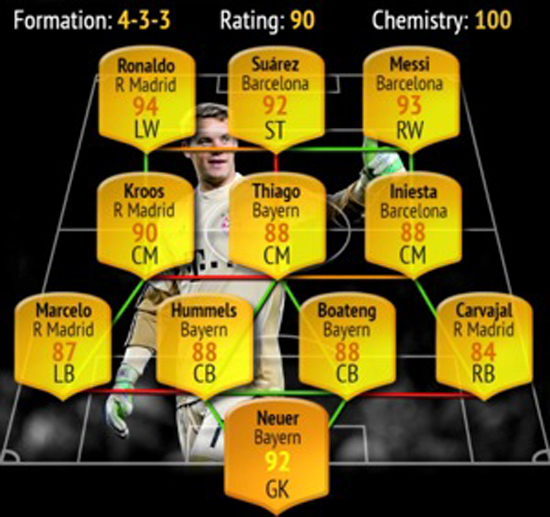 9 Bayern Munich players make the starting 11 – easy to see why they dominate! Best Possible Serie A 11 – 86 rated: Buffon – Sandro, Chiellini, Bonucci, Lichtsteiner – Hamsik, Matuidi, Nainggolan, Dybala – Dzeko, Higuain. 7 Juventus players make the starting 11 – only one AC Milan player despite the huge spending spree! Best Possible Ligue 1 11 – 85 rated: Ruffier – Evra, Silva, Glik, Dani Alves – Pastore, Fabinho, Verratti - Neymar, Cavani, Di Maria. 7 PSG players make the starting 11 – only 2 players from Monaco after their stars were poached by Europe's biggest teams! Overpowered players: Designed for gamers who don't invest in coins and are forever on the lookout for potential bargains to overachieve on Ultimate Team. Is Alli right to moan about his 84 rated card? Alli is the highest rated player on FIFA 18 who is under the age of 23 – only Real Madrid sensation Asensio matches the Tottenham midfielders rating! Alli does create less assists and score less goals than 88 rated Dybala (1.02 and 0.75) and 89 rated De Bruyne (0.72 and 0.75) - Alli needs to improve to command these type of ratings!